Monday afternoon, the Associated Press covered the just-released Supreme Court decision on Ohio's voter-roll purging procedures. 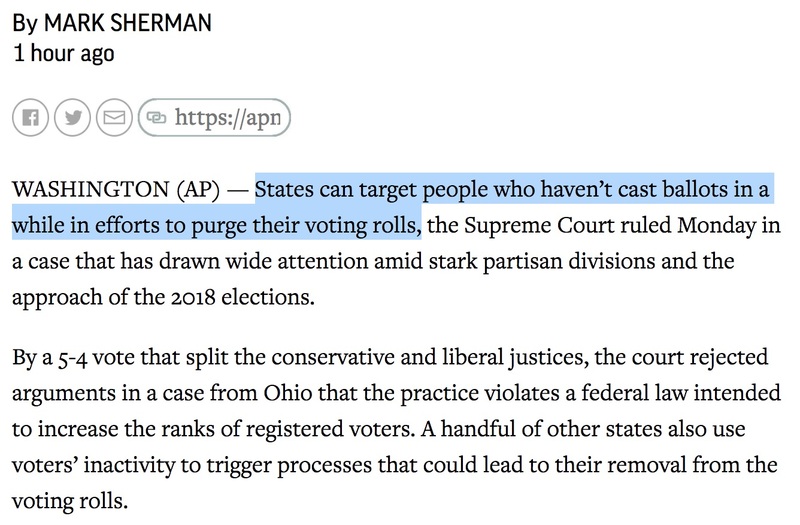 Both the APNews.com tease and reporter Mark Sherman's content misled readers by stating that the Court, in upholding those procedures, had declared that "States can target people who haven’t cast ballots in a while in efforts to purge their voting rolls." Since when is trying to make sure that voters still live where they say they live is a form of "targeting"? And since when is six years "a while"? 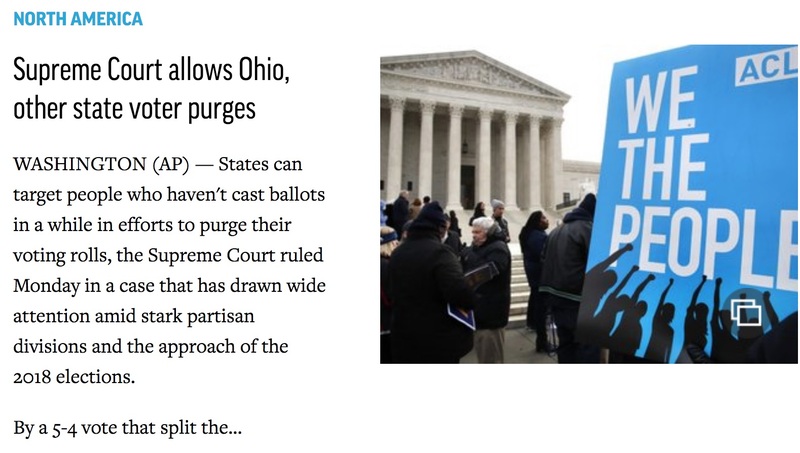 I included the AP photo seen on the right of the tease because its caption's opening is too funny to ignore: "In this Jan. 10, 2018 file photo, people rally outside of the Supreme Court in opposition to Ohio’s voter roll purges in Washington." That is a "rally"? The existence of obviously invalid registration records is an open invitation to voter fraud, especially given how easy states, including Ohio, have made absentee voting. 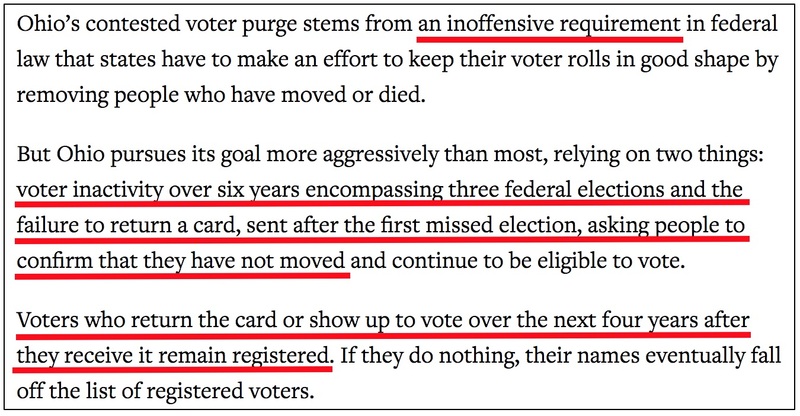 A Cleveland-area TV station found that "ghost voting" by people under the name of registered voters who had died was a known and far from inconsequential problem in Ohio way back in 2006 — and that was before Ohio began to allow no-excuse-needed absentee balloting. Readers don't learn until the seventh paragraph of the AP's report that Mark Sherman's definition of "a while" is six years of non-voting which includes three missed federal elections. Sherman's description of the federal law's requirement as "inoffensive" is gratuitous editorializing. If he was looking for an adjective, he should have called the requirement "important." The AP's and Sherman's strategy in this write-up is clear: Tell news consumers who only look at headlines and the opening sentence of this story on their smartphones, tablets, and other devices, or just look at the APNews.com teases, i.e., arguably most people who make contact with it, that "voters" are being purged, and not the inanimate objects known as voter rolls. Then give them the impression that the Court will let states conduct their purges in what appears to be (but really is not) a very short period of time, i.e., "a while." It seems likely that many broadcast journalists will eagerly adopt the AP's risible definition of "a while."